Blade:Ni-Cr-Mo(SAE8660)+VAN)(Nut driver:Chrome Vanadium)steel and fully hardened for greater durability. 1.Special Theft proof design(patented),just pull the red pin,cut it off and you can easily open or close it. 4.Well designed storage case gives easier access for busy workmen. 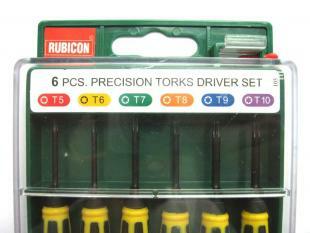 Find, Read Reviews & Buy cheap XBOX360 6PCS precision specific torks driver set tools T5/T6/T7/T8/T9/T10 RES-103 products at wholesale price from leading chinese supplier, enjoy online XBOX360 6PCS precision specific torks driver set tools T5/T6/T7/T8/T9/T10 RES-103 for sale and become wholesaler now!